There may be someone who may charge 500 bucks for a service/product. But there may be someone who will charge you 5000 bucks for the same! 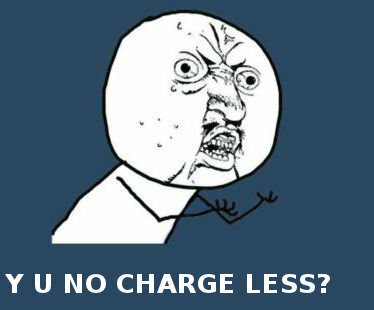 Same question is sometimes asked to freelancers ( My Dear clients sorry if it hurts ). And this question reminds me one of the best update on facebook by my friend Priyam Malhotra. If you ask yourself why ARTISTS (Photographers, Designers, Singers, Dancers, Musicians, Tattooists, Painters, Makeup artists, or anyone who falls under the artist category) charge “so much” for services… We don’t get paid vacation, we don’t get paid sick days, we don’t get bonuses for outstanding performances nor for Christmas. We don’t have insurance plans. We sacrifice our family on special days so that we can bring fond memories and happiness to others. Illness or personal affairs are not excuses for a bad performance. Next time you ask, remember that ARTISTS are ARTISTS because of the love of their craft, but that love doesn’t pay debts.. Happy Artists Day..!! So that would be mine answer too! In addition some may charge much as they are “Experienced One”, and trust me; sometimes you would like to give your work to Experienced one rather then those who are new in field! To summarize all I can say is what you paid is what you get. Last but not least, to Rajesh Pandey a.k.a. Pandu, for not disturbing while composing this whole jumbo mumbo. Y U NO GOOGLE IT?! And yes if am freelancing it doesn’t me i will be cheap or free.. There is a price tag associated with quality and if you wish quality you need to pay up..